As far as episodes go in the Black Mirror "The Waldo Moment" is not one of my favorites, but yet one of the most noteworthy in the series. 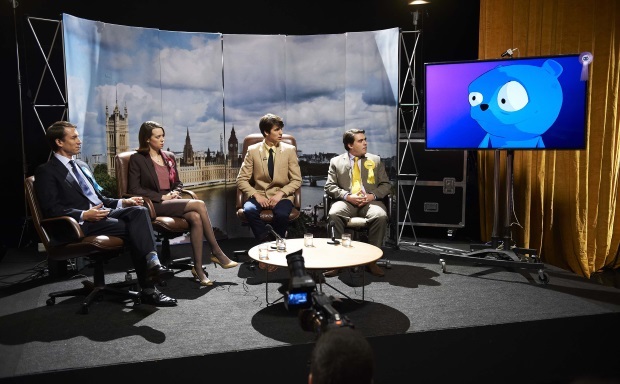 The episode premises is that a late night interview stunt in the form of a blue cartoon bear interviews political candidates in an aggressive and challenging way. The bear, Waldo, is population and the stunt continues when they pretend that the bear is going to run for office. The episode has come up since the Trump nomination and election win in the United States as being it's own "Waldo Moment," especially during campaigns when it seemed that what Trump did or said in any other reality would have made him a toxic candidate. I watched this episode after Trump was elected and found it interesting to look back at articles, like "Donald Trump's Troll Game of Jeb Bush: A+" from the Washington Post referencing this episode. It's interesting that one of the main things this series explores is the role of social media and the dissonance between who we are and what we present online then plays out in politics or other life sectors. In "Nosedive" we see online pandering presenting ourselves as more flattering or in "Shut Up and Dance" we see the secret side of the online world leading to extreme consequences. In a more collective way in "The National Anthem" we see group think taken to extremes online turning to forced political pressures, but here in "The Waldo Moment" we see secret attitudes (say online trolling or hatred such as in "Hated in the Nation") manifest itself in acceptance. Acceptance of a candidate who is not that far off from things that are surprisingly accepted in our comedy and social media. This is troubling. That comedy and online social media could allow us to accept certain things generations past would not, and suddenlty we have the ability to move on and appreciate someone from being "a straight shooter" or a "normal person." Or perhaps we don't accept these aspects of a person's character but see other virtues and quickly move on. "The Waldo Moment" seems to identify this shift well ahead of it's time in a way that certainly has some unique similarities to feelings or actions taken in the last American election. In many ways the populist movement we see in many places seems to say "we're not happy so take this" in the selection or acceptance of a strong candidate who might not have the pedigree of past commonly accepted criteria. Read other posts about Black Mirror on StrangeCultureBlog. See the post "Black Mirror Week" for other related post.